Such a beautiful collection of stories. There is an extraordinary amount of musicality in Gina's prose; her sentences, her words, just sing. Favorite stories: "How One Carries Another," "A Darkness Held," and "When The Dark Is Light Enough." When I was little, I often fantasized about what my life would be like if I had been born Russian. Apparently Gina Ochsner also has an Eastern European soul. Her characters are Finnish, Polish, Hungarian, Russian, Czech. Little miracles follow them around like bees.Her stories are magical, quirky and redeeming. Everybody gets their comeuppance and the world remains just as flawed and beautifully perfect as we suspected it might be.I loved all of these stories, but especially the very first one, "Articles of Faith." What a beautiful, rich story full of possibility and loss. You know that feeling when you're reading the works of a really good story-teller, the feeling that you're in good hands and are in for a real treat? Skepticism that slowly grows into trust, trust that grows into expectation, expectation that grows into anticipation? Gina Ochsner is a good and successful example of discovery of a favorite author through recommendation. A friend recommended 'People I Wanted to Be' long ago, and I was sufficiently intrigued by the title alone to want to read it. 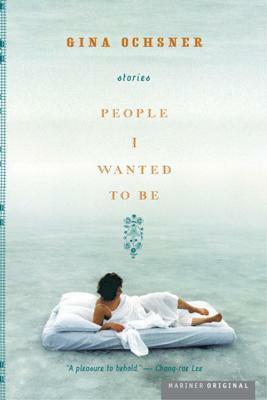 'People I Wanted to Be' consists of shortstories about heartaches and follies and loneliness and a different kind of courage. Most have a decidedly eastern European flavor to them, which is exotic enough in itself, what with the oiled carp and Orthodox church icons needing to be kissed, but what make the stories in this collection really shine are the characters. A mother who's lost three of her children in a series of miscarriages, a lonely painter unhappy with his life and longing to ask the pretty artist in his office for coffee but ending up running errands for the whole office, two coroners who are probably no more alive than the corpses they work on, a man cheated out of the children he wanted to have by a woman he loves. The stories read like especially tragic fairytale, the storytelling tight and liquid and sharply beautiful. مجموعة قصص قصيرة، كما أُذيعت على محطة اذاعة البي بي سي ٤.كل قصة لها سمة مختلفة وجو ووجود مختلف، ليست القصص بذاتها ما يعطيك ذاك الانطباع العميق الازرق ..الرمادي حتى.لكن بناء وتركيب الشخصيات ومحيطها فيه غرابة وتميز واختلاف. The title held such promise. This collection is masterfully written, the stories full of nuance and moving between firm realism and supernatural gothic. Regardless of the tone or themes of the individual stories, they are all incredibly evocative, playing on subtle emotional exchanges, often between lovers but not always. None of the stories are repetitive, which I found remarkable, and a few are reasonably absurd and with the absurdity comes a dark kind of humor. It really is a fantastic collection with a variety of types of stories and a showcase of characters, diverse in their nature even when their origins might be similar. I like to read and support local fiction, so I picked up this collection of short stories by Oregon writer Gina Ochsner, her second. Her first one, The Necessary Grace to Fall, I have not read, but apparently it won the Oregon Book Award.People I Wanted to Be didn't impress me much. Ochsner writes, usually in the first person, very clear, direct prose, with little flair for physical description, despite the fact many of her stories take place in Siberia and other desolate Eastern European locales. Her sentences are simple and unmemorable. Her protagonists tend to be humble, dumpy male dreamers, usually stuck in awful-sounding relationships with the only woman in their area as dumpy as them. Most of these supporting wife characters are bitter and spiteful and miserable, which got very tiresome after a while.Many of the stories in People don't even feel like complete stories, but sort of embellished little scenes that might be stories someday. Ochsner has a little flair for the absurd, but most of her little comedic touches aren't very funny, like the out-of-control mynah bird in "Last Words of the Mynah Bird." Most of the stories were easy enough to read, if not enjoyable; kind of like eating brown rice with nothing on it. Two noteworthy exceptions were the last story, The Fractious South, previously published in the New Yorker; and a previously unpublished story called "A Darkness Held." "A Darkness Held" seems like a bit of a departure for Ochsner. Its protagonist is a miserable woman, but she's no bitter wife, but rather a single, unemployed teacher and a lapsed Catholic who was once vying for a shot in the nunnery. Now she's a 30-something alcoholic chain-smoker. One day, her old Catholic school teacher, a terrifying nun named Sister Clement, becomes hospitalized, and requests, out of the blue, that drunken Imogene be the sub for her class. It's a pretty good premise for a story from a writer who does not have strong plot premises, but relies more on situation and character. Memorable characters too. "The Fractious South" is another installment in Ochsner's "miserable couples living in grim Eastern European locales" series, but its details are richer, the bitter, spiteful wife character more rounded, the physical world of it more colorful. I don't know if it's New Yorker quality, but it's maybe the best story in a pretty mediocre collection. I am somewhat conflicted about this book. Gina Ochsner is a supremely gifted writer and I really liked her previous collection of stories, "The Necessary Grace to Fall," a good deal. I also have a personal connection with her, having crossed paths with her when we were both English majors at George Fox University (née College) many many years ago. So I am rooting for her to be successful. However, I simply didn't connect with these stories as strongly as I did with those in the earlier volume.The book starts slowly with the somewhat unapproachable stories "Articles of Faith" and "Last Words of the Mynah Bird," both tales of unhappy marriages. I couldn't connect emotionally with these characters, and I can't fully tell you why. Perhaps their circumstances are simply so different from my own that I can't find a way in to their lives. Their geography, lifestyles, hopes and dreams, social mores, etc. are all very foreign. And in less than 20 pages it is hard to overcome so much other-ness.The next story, "How One Carries Another," is better. It is another tale of a family finding a way to deal with grief (a common theme in this collection) and there is an element of the mysterious or magical in this one too, as there was in the previous two pieces. But for some reason, I found the characters and situation more accessible. Perhaps it is the fact that this story is set in Oregon and not in Russia or the Czech Republic or some other Eastern European locale (as many of Ochsner's stories are) that makes it easier for me to connect. I'm not sure.And so it goes. Some of these stories are exceptional ("A Darkness Held," "A Blessing," "When the Dark is Light Enough" etc.) and others . . . not so much ("The Hurler," "From the Fourth Row"). I still think the world of Gina and her talent is evident in every paragraph she pens; for her prose alone this book is well worth reading. When at her best, she also makes some very astute observations of the human condition. So I still recommend this book. Just know that if you embark on a journey with these tales, it could be a bit of a roller-coaster ride. I forced my way through this hoping I'd come upon one or two redeeming stories to make it all worthwhile. In the end, a couple of stories stood out a bit but not enough to salvage the collection for me. The prose was lyrical but the stories themselves just too detached and depressing (and I like a good tragedy). Honestly I couldn't figure out why most of the main characters hadn't just killed themselves already, and why any of them would want to bring children into their world. And what was with half the stories (okay, maybe only a third of them) being about couples having trouble conceiving? 08/03/08TITLE/AUTHOR: PEOPLE I WANTED TO BE by Gina OchsnerRATING: 4/BGENRE/PUB DATE/# OF PGS: Short Stories/2005/204 FIRST LINES: From 1st story "Articles of Faith" The ghosts of the 3 children set up residence in the kataa next to the fishing rods & burlap sacks of potatoes, behind the shovels & rakes.COMMENTS:06/07/08 purchase @ Discount Book Gallery (Decatur) for August discussion. Well written, the 1st story was my favorite. Not sure who of these characters the author would like to be -- they all seemed a bit sad & lost. These are terrific short stories by a gifted writer! Because of the settings--several of these stories are set in Russia or Latvia, or they have Eastern European cultural influences--I thought Ochsner must be of EE origin. Not so; she's just an incredibly gifted writer who loves to research other cultures and render them in her stories. Some stories are achingly sad and funny at the same time. Almost all have a touch of magical realism, which she handles with skill. I liked the atmosphere that Ochsner created in her stories. You were never sure quite what was happening, what was real, what was not. And yet at no point did they spin off into realms of complete fantasy or horror. It was more as if she had peeled back the sheen of normality to expose the unusual that lies beneath everyday experiences. I'd love to see what she could do with a novel. i discovered ochsner from the nyer and captured this from one of her stories, can't remember which one: " as evening tipped into night, the moon roiled about as if cast on a fishing line. . . though i already had an infant hangover threatening to cut its teeth, i kept on drinking." vivid images, i am always impressed by such evocative writing. i can't wait to read an entire piece. Read first 3 stories before the library demanded it back. So magical and unsentimentally moving. "How One Carries Another" has an odd resonance with Kieslowski's "Double Life of Veronique"--the stranger leaving clues to a truth somehow inside of the self. This book justifies my insistence of always reading a book through to the end. This book was a rough read until "When the Dark Is Light". From that point forward, the book was sooooo good it was worth all the torture that came before. i couldn't read the whole thing and gave it away..
this book had its moments of beauty but everything was so poignent and sad that it became depressing. so in the end I have to say that I wasn't a huge fan. Gina Ochsner - GINA OCHSNER is the author of two collections of short stories, People I Wanted to Be and The Necessary Grace to Fall, both of which won the Oregon Book Award. Her work has appeared in The New Yorker, The Best American Nonrequired Reading, Glimmer Train, and others. She is a recipient of the Flannery OConnor Award, the Ruth Hindman Foundation Prize, Guggenheim and NEA Grants, and the Raymond Carver Prize. She lives in Oregon. "